Featuring Rare and Vintage books, Ephemera, Posters, Art Books, Prints, Photos, Children’s Books, Manuscripts, Collections, First Editions. 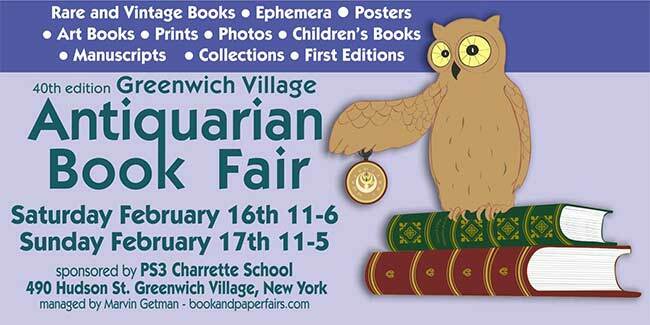 Visit as well the official Greenwich Village Antiquarian Book Fair Site. NEW YORK, Feb 1, 2018 – In its 39th year, the Greenwich Village Antiquarian Book Fair is a West Village neighborhood tradition that brings together some of the country’s best known dealers, collectors, and community members to benefit PS3 The Charrette School. This year’s event will take place on Feb. 17-18 at the historic school. Those with a keen eye for rare and vintage books, first editions, ephemera, posters, art books, unique children’s books, manuscripts, and hard-to-find collections are sure to uncover something coveted. Collectors will be on hand to help everyone navigate the items for sale, and no previous knowledge is necessary. The Greenwich Village Antiquarian Book Fair is one of many fundraisers that help to provide exceptional academic and extracurricular activities for students in grades pre-k through 5. “We’re pleased to be featuring a section for photo dealers specializing in snapshots, ambrotypes, daguerreotypes, cyanotypes, cabinet cards, tintypes, CDVs, and photo albums. The public is welcome to visit the fair on Saturday, Feb. 18, from 11 a.m. to 6 p.m., and on Sunday, Feb. 19, from 11 a.m. to 5 p.m. Admission is $10 per person. 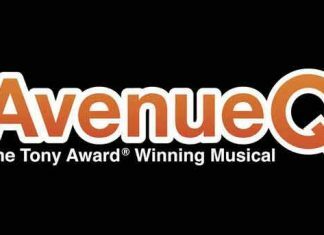 Half price coupons are available on the website GVABF.com. Children under 16 and students with a college I.D.are admitted free. The school is located at 490 Hudson St.
Lexington, Mass.-based Book and Paper Fairs specializes in the production of rare book and ephemera fairs in the Northeast United States. The company organizes notable events such as the New York City Book and Ephemera Fair, . the Brooklyn Antiquarian Book Fair, The Ephemera Fair in Greenwich, CT., the Boston West Book Print and Ephemera Fair, the Granite State Book and Ephemera Fair in Concord, N.H., and the Boston Book Print and Ephemera Fair. Dealers interested in participating in the 39th Annual Greenwich Village Antiquarian Book Fair may contact Marvin Getman at [email protected]. . The first public school known as PS3 was established in the 1820s, when the visiting Marquis de Lafayette toured this model of progressive American education. The current PS3, also known as the John Melser Charrette School, was founded in 1971 as a progressive and experimental school. The PS3 of today came into being through a community workshop process known as a charrette, at which parents and other community members, teachers, administrators, public officials, social planners, and educational consultants arrived at a vision of child-centered learning in open multi-age classrooms, with a nonhierarchical structure, active parent involvement, and an emphasis on the arts.